↑ 1.0 1.1 1.2 1.3 1.4 1.5 Daneman, R; Prat, A (2015). "The Blood-Brain Barrier". Cold Spring Harbor Perspectives in Biology. 7 (1): a020412. doi:10.1101/cshperspect.a020412. PMC 4292164. PMID 25561720. ↑ Ballabh, Praveen; Braun, Alex; Nedergaard, Maiken (2004). 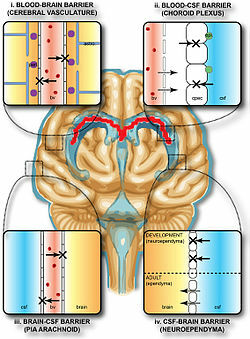 "The blood-brain barrier: an overview: Structure, regulation, and clinical implications". Neurobiology of Disease. 16 (1): 1–13. doi:10.1016/j.nbd.2003.12.016. PMID 15207256. ↑ Johansen, A; Hansen, HD; Svarer, C; Szabolcs, L; Leth-Petersen, S; Kristensen, JL; Gillings, N; Knudsen, GM (2017). "The importance of small polar radiometabolites in molecular neuroimaging: A PET study with [11C]Cimbi-36 labeled in two positions". Journal of Cerebral Blood Flow and Metabolism. Epub (4): 659–668. doi:10.1177/0271678x17746179. PMC 5888860. PMID 29215308. ↑ 4.0 4.1 4.2 Stamatovic, Svetlana M.; Keep, Richard F.; Andjelkovic, Anuska V. (2008). "Brain Endothelial Cell-Cell Junctions: How to 'Open' the Blood Brain Barrier". Current Neuropharmacology. 6 (3): 179–92. doi:10.2174/157015908785777210. PMC 2687937. PMID 19506719. ↑ Leeuwen, Lisanne Martine van; Evans, Robert J.; Jim, Kin Ki; Verboom, Theo; Fang, Xiaoming; Bojarczuk, Aleksandra; Malicki, Jarema; Johnston, Simon Andrew; Sar, Astrid Marijke van der (2018-02-15). "A transgenic zebrafish model for the in vivo study of the blood and choroid plexus brain barriers using claudin 5". Biology Open (in อังกฤษ). 7 (2): bio030494. doi:10.1242/bio.030494. ISSN 2046-6390. PMC 5861362. PMID 29437557. ↑ Abbott, N. Joan; Rönnbäck, Lars; Hansson, Elisabeth (2006). "Astrocyte-endothelial interactions at the blood-brain barrier". Nature Reviews Neuroscience. 7 (1): 41–53. doi:10.1038/nrn1824. PMID 16371949. (Subscription required (help)). ↑ Hamilton, R. D.; Foss, A. J.; Leach, L. (2007). "Establishment of a humanin vitromodel of the outer blood-retinal barrier". Journal of Anatomy. 211 (6): 707–16. doi:10.1111/j.1469-7580.2007.00812.x. PMC 2375847. PMID 17922819 – โดยทาง Wiley Online Library. ↑ Gilgun-Sherki, Yossi; Melamed, Eldad; Offen, Daniel (2001). "Oxidative stress induced-neurodegenerative diseases: the need for antioxidants that penetrate the blood brain barrier". Neuropharmacology. 40 (8): 959–75. doi:10.1016/S0028-3908(01)00019-3. PMID 11406187 – โดยทาง Elsevier ScienceDirect. (Subscription required (help)). ↑ 11.0 11.1 Braun, Leon D.; Cornford, Eain M.; Oldendorf, William H. (1980). "Newborn Rabbit Blood-Brain Barrier Is Selectively Permeable and Differs Substantially from the Adult". Journal of Neurochemistry. 34 (1): 147–52. doi:10.1111/j.1471-4159.1980.tb04633.x. PMID 7452231. ↑ 12.0 12.1 12.2 12.3 Raza, Muhammad W.; Shad, Amjad; Pedler, Steve J; Karamat, Karamat A. (2005). "Penetration and activity of antibiotics in brain abscess". Journal of the College of Physicians and Surgeons Pakistan. 15 (3): 165–7. PMID 15808097. ↑ Pardridge, William M (2011). "Drug transport in brain via the cerebrospinal fluid". Fluids Barriers CNS. 8 (1): 7. doi:10.1186/2045-8118-8-7. PMC 3042981. PMID 21349155. ↑ Nizet, V; KS, Kim; M, Stins; M, Jonas; EY, Chi; D, Nguyen; CE, Rubens (1997). "Invasion of brain microvascular endothelial cells by group B streptococci". Infection and Immunity. 65 (12): 5074–5081. PMC 175731. PMID 9393798. ↑ Zysk, Gregor (2001). "Pneumolysin Is the Main Inducer of Cytotoxicity to Brain Microvascular Endothelial Cells Caused by Streptococcus Pneumoniae". Infection and Immunity. 69 (2): 845–852. doi:10.1128/IAI.69.2.845-852.2001. PMC 97961. PMID 11159977. ↑ Van Sorge, Nina M (2012). "Defense at the border: the blood-brain barrier versus bacterial foreigners". Future Microbiol. 7 (3): 383–394. doi:10.2217/fmb.12.1. PMC 3589978. PMID 22393891. ↑ 20.0 20.1 Gross, P. M (1992). "Circumventricular organ capillaries". Progress in Brain Research. 91: 219–33. PMID 1410407. ↑ 21.0 21.1 Miyata, S (2015). "New aspects in fenestrated capillary and tissue dynamics in the sensory circumventricular organs of adult brains". Frontiers in Neuroscience. 9: 390. doi:10.3389/fnins.2015.00390. PMC 4621430. PMID 26578857. ↑ 22.0 22.1 22.2 22.3 Rodríguez Esteban M.; Blázquez Juan L.; Guerra Montserrat (2010). "The design of barriers in the hypothalamus allows the median eminence and the arcuate nucleus to enjoy private milieus: The former opens to the portal blood and the latter to the cerebrospinal fluid". Peptides. 31 (4): 757–76. doi:10.1016/j.peptides.2010.01.003. PMID 20093161. ↑ 23.0 23.1 Gross, PM; Wall, KM; Pang, JJ; Shaver, SW; Wainman, DS (1990). "Microvascular specializations promoting rapid interstitial solute dispersion in nucleus tractus solitarius". American Journal of Physiology. Regulatory, Integrative and Comparative Physiology. 259 (6 Pt 2): R1131–8. doi:10.1152/ajpregu.1990.259.6.R1131. PMID 2260724. ↑ 24.0 24.1 Shaver, SW; Pang, JJ; Wainman, DS; Wall, KM; Gross, PM (1992). "Morphology and function of capillary networks in subregions of the rat tuber cinereum". Cell and Tissue Research. 267 (3): 437–48. PMID 1571958. ↑ Marcos-Contreras, O. A.; Martinez de Lizarrondo, S.; Bardou, I.; Orset, C.; Pruvost, M.; Anfray, A.; Frigout, Y.; Hommet, Y.; Lebouvier, L.; Montaner, J.; Vivien, D.; Gauberti, M. (2016). "Hyperfibrinolysis increases blood brain barrier permeability by a plasmin and bradykinin-dependent mechanism". Blood. 128 (20): 2423–2434. doi:10.1182/blood-2016-03-705384. PMID 27531677. ↑ McDannold, Nathan; Vykhodtseva, Natalia; Hynynen, Kullervo (May 2008). "Blood-brain barrier disruption induced by focused ultrasound and circulating preformed microbubbles appears to be characterized by the mechanical index". Ultrasound in Medicine and Biology. Elsevier. 34 (5): 834–840. doi:10.1016/j.ultrasmedbio.2007.10.016. PMC 2442477. PMID 18207311. ↑ Wiley, Devin (2013). "Transcytosis and brain uptake of transferrin-containing nanoparticles by tuning avidity to transferrin receptor". Proc Natl Acad Sci U S A. 110 (21): 8662–7. Bibcode:2013PNAS..110.8662W. doi:10.1073/pnas.1307152110. PMC 3666717. PMID 23650374. ↑ Krol, Silke; MacRez, Richard; Docagne, Fabian; Defer, Gilles; Laurent, Sophie; Rahman, Masoud; Hajipour, Mohammad J.; Kehoe, Patrick G.; Mahmoudi, Morteza (2013). "Therapeutic Benefits from Nanoparticles: The Potential Significance of Nanoscience in Diseases with Compromise to the Blood Brain Barrier". Chemical Reviews. 113 (3): 1877–1903. doi:10.1021/cr200472g. PMID 23157552 – โดยทาง ACS Publications. (Subscription required (help)). ↑ Silva, GA (December 2008). "Nanotechnology approaches to crossing the blood-brain barrier and drug delivery to the CNS". BMC Neuroscience. 9: S4. doi:10.1186/1471-2202-9-S3-S4. PMC 2604882. PMID 19091001 – โดยทาง BioMed Central. ↑ Brigger, I.; Morizet, J; Aubert, G; Chacun, H; Terrier-Lacombe, MJ; Couvreur, P; Vassal, G (December 2002). "Poly (ethylene glycol) -coated hexadecylcyanoacrylate nanospheres display a combined effect for brain tumor targeting". Journal of Pharmacology and Experimental Therapeutics. 303 (3): 928–36. doi:10.1124/jpet.102.039669. PMID 12438511 – โดยทาง ASPET. ↑ "cytopempsis". The Free Dictionary. ↑ Perez, J. H.; Branch, W. J.; Smith, L.; Mullock, B. M.; Luzio, J. P. (1988). "Investigation of endosomal compartments involved in endocytosis and transcytosis of polymeric immunoglobulin a by subcellular fractionation of perfused isolated rat liver". The Biochemical Journal. 251 (3): 763–770. doi:10.1042/bj2510763. PMC 1149069. PMID 3415644. ↑ Fishman, J. B.; Rubin, J. B.; Handrahan, J. V.; Connor, J. R.; Fine, R. E. (1987). "Receptor-mediated transcytosis of transferrin across the blood-brain barrier". Journal of Neuroscience Research. 18 (2): 299–304. doi:10.1002/jnr.490180206. PMID 3694713. ↑ Duffy, K. R.; Pardridge, W. M. (1987). "Blood-brain barrier transcytosis of insulin in developing rabbits". Brain Research. 420 (1): 32–38. doi:10.1016/0006-8993(87)90236-8. PMID 3315116. ↑ Kreuter, Jörg (2014). "Drug delivery to the central nervous system by polymeric nanoparticles: What do we know?". Advanced Drug Delivery Reviews. 71: 2–14. doi:10.1016/j.addr.2013.08.008. PMID 23981489 – โดยทาง Elsevier ScienceDirect. (Subscription required (help)). ↑ Hashizume, Hiroya; Baluk, Peter; Morikawa, Shunichi; McLean, John W.; Thurston, Gavin; Roberge, Sylvie; Jain, Rakesh K.; McDonald, Donald M. (April 2000). "Openings between Defective Endothelial Cells Explain Tumor Vessel Leakiness". American Journal of Pathology. 156 (4): 1363–80. doi:10.1016/S0002-9440(10)65006-7. PMC 1876882. PMID 10751361. ↑ Schneider, Stefan W.; Ludwig, Thomas; Tatenhorst, Lars; Braune, Stephan; Oberleithner, Hans; Senner, Volker; Paulus, Werner (March 2004). "Glioblastoma cells release factors that disrupt blood-brain barrier features". Acta Neuropathologica. 107 (3): 272–6. doi:10.1007/s00401-003-0810-2. PMID 14730455 – โดยทาง SpringerLink. (Subscription required (help)). ↑ Van Dorpe, Sylvia; Bronselaer, Antoon; Nielandt, Joachim; Stalmans, Sofie; Wynendaele, Evelien; Audenaert, Kurt; Van De Wiele, Christophe; Burvenich, Christian; Peremans, Kathelijne; Hsuchou, Hung; De Tré, Guy; De Spiegeleer, Bart (2012). "Brainpeps: the blood-brain barrier peptide database". Brain Structure and Function. 217 (3): 687–718. doi:10.1007/s00429-011-0375-0. PMID 22205159 – โดยทาง SpringerLink. (Subscription required (help)). ↑ "Transport at the Blood Brain Barrier (BBB)". The Davis Lab. The University of Arizona. Archived from the original on 2018-02-10. สืบค้นเมื่อ 2015-01-05. ↑ Ermisch, A.; Ruhle, H.-J. ; Neubert, K.; Hartrodt, B.; Landgraf, R. (1983). "On the Blood-Brain Barrier to Peptides: [3H]βCasomorphin-5 Uptake by Eighteen Brain Regions In Vivo". Journal of Neurochemistry. 41 (5): 1229–33. doi:10.1111/j.1471-4159.1983.tb00816.x. PMID 6619862 – โดยทาง Wiley Online Library. (Subscription required (help)). ↑ Beam, T. R.; Allen, J. C. (December 1977). "Blood, Brain, and Cerebrospinal Fluid Concentrations of Several Antibiotics in Rabbits with Intact and Inflamed Meninges". Antimicrobial Agents and Chemotherapy. 12 (6): 710–6. doi:10.1128/AAC.12.6.710. PMC 430009. PMID 931369. ↑ Nordqvist, Christian (2010-04-16). "What Is A Brain Abscess (Cerebral Abscess) ?". MNT Knowledge Center. Medical News Today. Archived from the original on 2010-04-18. ↑ Oby, Emily; Janigro, Damir (2006). "The Blood-Brain Barrier and Epilepsy". Epilepsia. 47 (11): 1761–1774. doi:10.1111/j.1528-1167.2006.00817.x. ISSN 0013-9580. PMID 17116015. ↑ Marchi, Nicola; Angelov, Lilyana; Masaryk, Thomas; Fazio, Vincent; Granata, Tiziana; Hernandez, Nadia; Hallene, Kerri; Diglaw, Tammy; Franic, Linda; Najm, Imad; Janigro, Damir (2007). "Seizure-Promoting Effect of Blood?Brain Barrier Disruption". Epilepsia. 48 (4): 732–42. doi:10.1111/j.1528-1167.2007.00988.x. PMC 4135474. PMID 17319915. ↑ Uva, L.; Librizzi, L.; Marchi, N.; Noe, F.; Bongiovanni, R.; Vezzani, A.; Janigro, D.; De Curtis, M. (2008). "Acute induction of epileptiform discharges by pilocarpine in the in vitro isolated guinea-pig brain requires enhancement of blood-brain barrier permeability". Neuroscience. 151 (1): 303–12. doi:10.1016/j.neuroscience.2007.10.037. PMC 2774816. PMID 18082973. ↑ Van Vliet, E. A.; Da Costa Araujo, S.; Redeker, S.; Van Schaik, R.; Aronica, E.; Gorter, J. A. (2007). "Blood-brain barrier leakage may lead to progression of temporal lobe epilepsy". Brain. 130 (2): 521–534. doi:10.1093/brain/awl318. PMID 17124188. ↑ Awasthi, Sanjay; Hallene, Kerri L; Fazio, Vince; Singhal, Sharad S; Cucullo, Luca; Awasthi, Yogesh C; Dini, Gabriele; Janigro, Damir (2005). "RLIP76, a non-ABC transporter, and drug resistance in epilepsy". BMC Neuroscience. 6: 61. doi:10.1186/1471-2202-6-61. PMC 1249579. PMID 16188027. ↑ Waubant, Emmanuelle (2006). "Biomarkers indicative of blood-brain barrier disruption in multiple sclerosis". Disease Markers. 22 (4): 235–44. doi:10.1155/2006/709869. PMC 3850823. PMID 17124345. ↑ Schinkel, AH (April 1999). "P-Glycoprotein, a gatekeeper in the blood-brain barrier". Advanced Drug Delivery Reviews. 36 (2–3): 179–194. doi:10.1016/S0169-409X(98)00085-4. PMID 10837715. ↑ Schreibelt, G; Musters, RJ; Reijerkerk, A; De Groot, LR; Van Der Pol, SM; Hendrikx, EM; Döpp, ED; Dijkstra, CD; Drukarch, B; De Vries, HE (August 2006). "Lipoic acid affects cellular migration into the central nervous system and stabilizes blood-brain barrier integrity". J. Immunol. 177 (4): 2630–7. doi:10.4049/jimmunol.177.4.2630. PMID 16888025. ↑ Lennon, V. A.; Kryzer, TJ; Pittock, SJ; Verkman, AS; Hinson, SR (August 2005). "IgG marker of optic-spinal multiple sclerosis binds to the aquaporin-4 water channel". J. Exp. Med. 202 (4): 473–7. doi:10.1084/jem.20050304. PMC 2212860. PMID 16087714. ↑ Zipser, BD; Johanson, CE; Gonzalez, L; Berzin, TM; Tavares, R; Hulette, CM; Vitek, MP; Hovanesian, V; Stopa, EG (2007). "Microvascular injury and blood-brain barrier leakage in Alzheimer's disease". Neurobiology of Aging. 28 (7): 977–86. doi:10.1016/j.neurobiolaging.2006.05.016. PMID 16782234. (Subscription required (help)). ↑ Nagele, Robert G. (2006). "Alzheimer's disease: new mechanisms for an old problem". UMDNJ Research. 7 (2). Archived from the original on 2011-09-17. สืบค้นเมื่อ 2011-07-22. ↑ Ivey, Nathan S; MacLean, Andrew G; Lackner, Andrew A (2009). "Acquired immunodeficiency syndrome and the blood-brain barrier". Journal of Neurovirology. 15 (2): 111–22. doi:10.1080/13550280902769764. PMC 2744422. PMID 19306229. ↑ Varatharaj, Aravinthan; Galea, Ian (2016). "The blood-brain barrier in systemic inflammation". Brain, Behavior, and Immunity. 60: 1–12. doi:10.1016/j.bbi.2016.03.010. PMID 26995317. ↑ Ortiz, GG; Pacheco-Moisés, FP; Macías-Islas, MÁ; Flores-Alvarado, LJ; Mireles-Ramírez, MA; González-Renovato, ED; Hernández-Navarro, VE; Sánchez-López, AL; Alatorre-Jiménez, MA (November 2014). "Role of the blood-brain barrier in multiple sclerosis". Archives of Medical Research. 45 (8): 687–97. doi:10.1016/j.arcmed.2014.11.013. PMID 25431839. ↑ Erickson, MA; Banks, WA (October 2013). "Blood-brain barrier dysfunction as a cause and consequence of Alzheimer's disease". Journal of Cerebral Blood Flow and Metabolism. 33 (10): 1500–13. doi:10.1038/jcbfm.2013.135. PMC 3790938. PMID 23921899. ↑ 67.0 67.1 Saunders, N. R; Dziegielewska, K. M; Møllgård, K; Habgood, M. D (2015). "Markers for blood-brain barrier integrity: How appropriate is Evans blue in the twenty-first century and what are the alternatives?". Frontiers in Neuroscience. 9: 385. doi:10.3389/fnins.2015.00385. PMC 4624851. PMID 26578854. ↑ "History of Blood-Brain Barrier". Davis Lab. Archived from the original on 2018-01-11. สืบค้นเมื่อ 2015-01-05. ↑ "History of Blood-Brain Barrier". The Davis Lab. University of Arizona. Archived from the original on 2012-04-25. สืบค้นเมื่อ 2014-03-01. Derricott, Caitlin (2015). "Using water-solvent systems to estimate in vivo blood-tissue partition coefficients". Chemistry Central. 9 (58). สืบค้นเมื่อ 2015-10-16.